We are grateful for your collaboration! 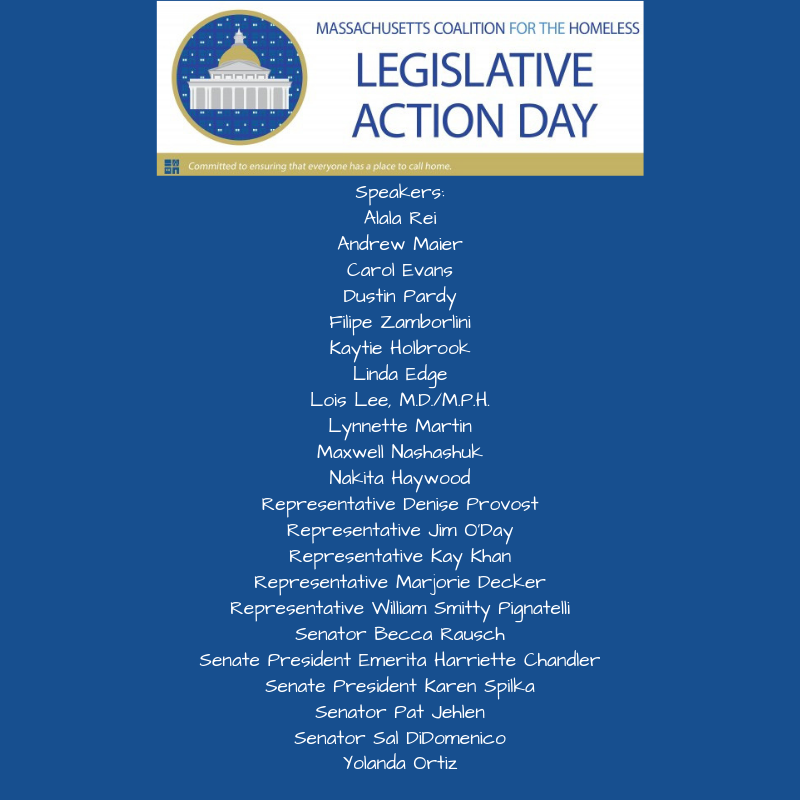 We are especially grateful to all of our event volunteers, including planning team member Charles Dietrick, and speakers: community members with lived experience of homelessness, legislators, and advocates (see the speaker list below). Check out some photos from the day . 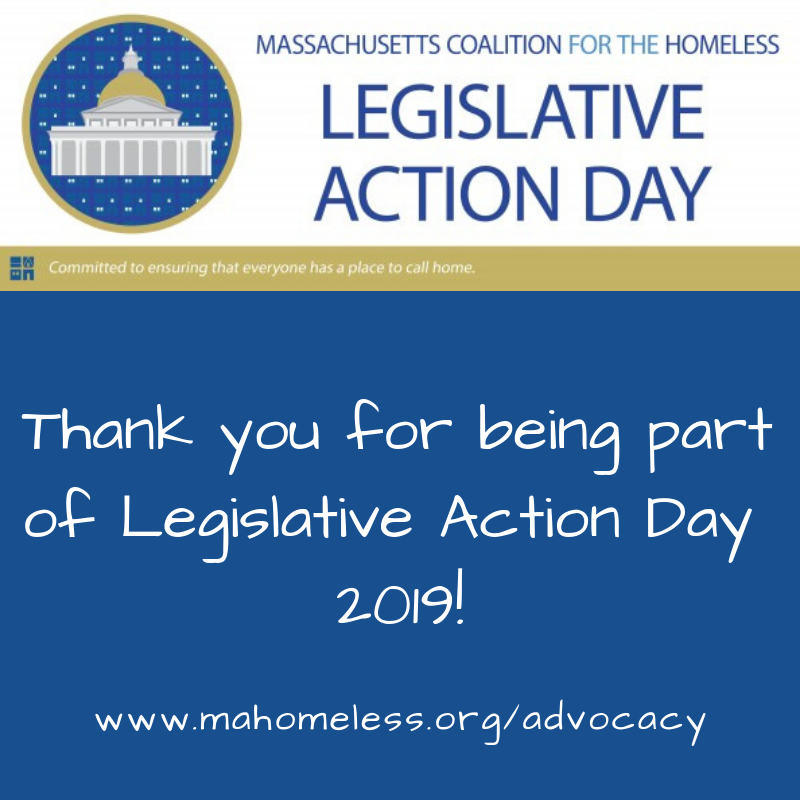 We also are very thankful to everyone who met and/or called legislators and staff in the afternoon to advocate for key homelessness and housing bill and budget priorities. Links to fact sheets on the Coalition's key FY'20 budget requests and 2019-2020 bill priorities are on our policy campaigns page . If you did speak with legislators and staff, please complete the legislative response form . If you didn't, it is not too late! Please contact your State Representative and State Senator and/or their staff in the week ahead to express your support for the Coalition's budget and bill priorities . Ask your State Senator and State Representative to actively support these priorities throughout the FY'20 budget process and this bill session. Legislators' contact information can be found at www.malegislature.gov/people/search or at www.wheredoivotema.com . Here are some other tips for talking to legislative offices .